His ears were pinned back, his breathing quick and shallow, neck tensed and arched high. Positioned in the far end of the round-pen, his muscles were tightened and ready to charge at me. I was in the middle of a 60-foot pen with a wild mustang, and it was my job to train him. I will never forget looking into a wild horse’s eyes for the first time, the fear mixed with curiosity, anger mixed with longing, independence mixed with desperation. At the age of 19 I had been hired to train Outlaw, a 3-year-old American Wild Mustang, in just four short months. I have trained many horses in my life, some who had never been under saddle, but from the moment I met Outlaw I knew he was going to be special, and my biggest challenge yet. Working as a horse trainer, I am often hired by different individuals and organizations to work with their horses. Outlaw belonged to a children’s camp that also doubled as a rescue center for horses. After exhausting many options, I was approached by the camp in their attempt to give Outlaw one last chance. Outlaw had never encountered human touch before, and in his mind every human was going to do him harm. He was afraid of everything. Horses are simple creatures. They are selfish, self-dependent prey animals, and because of this, many of their instinctive reactions are based in a desire to protect themselves from danger. Horses have two responses to fear: fight or flight. Their initial reaction is to flee from whatever they are afraid of, but if they know they are trapped they will ready themselves to fight. For the first few days of training, I did nothing but sit on the edge of Outlaw’s pen and talk to him calmly, allowing him to familiarize himself with my voice and presence. The following three days consisted of sitting inside the pen on a stool for hours at a time, not saying a word. I would not approach him or try to force his trust. I would simply wait and give him the choice to pursue a relationship with me. I wanted it to be his idea to come to me, and when he decided he was ready, I would be there. As I sat on the stool watching Outlaw and studying his body language, it occurred to me, am I not the Outlaw in my relationship with God? God is constantly sitting there waiting for me to pursue a relationship with Him. He never pushes, He does not force me to come to Him, but He gives me free will so when I do come to Him, I come on my own accord. God does not push, He does not pressure and He never loses patience. He sits with open arms ready to accept me as soon as I am willing to accept Him. God does not saddle us with His plan, jump on our back and hope He can hang on until He breaks our will. He waits with endless patience for us to accept His love and guidance. When I first stepped foot in the pen with Outlaw, he knew he would not be able to escape, so he tried to fight me. Nostrils flaring in fear, tail high in anticipation, he would charge at me, unable to understand my intentions, my plan, and too afraid to find out. So often in life this is what I find myself doing, either running as far away from God as possible, or fighting Him at every turn, yet Christ continues to sit with arms open wide waiting for me to come to Him. After five days of nothing but talking and doing a therapy called T-touch, Outlaw finally began to let his guard down and let me closer. Next came a technique that many trainers use called “joining up.” This method illuminates God’s nature and demonstrates just what it means to obtain rest in an intimate relationship with God. This method is done in a round pen where the trainer drives the horse away from them using body position and eye contact. Once the horse begins submitting to the trainer’s command, the body language changes and the handler invites the horse to approach. If the horse does not approach respectfully, he is sent back out to the outside of the ring to continue working. The technique aims to give the horse a choice between accepting the trainer as a herd leader or continuing to deny his/her authority. The horse is allowed to find rest once they acknowledge the trainer’s authority and attach intimately. When this moment came for Outlaw and me, and he began looking to me for guidance, I changed my body language. I immediately lowered my gaze, softened my stance and turned my back on Outlaw taking a few steps away from him. By doing this I asked Outlaw to settle and allowed him to approach and “join up,” which is a method of bonding with a horse through body language and positioning. This was not a method Outlaw understood right away. It took many tries until he was be able to discern my intentions for him and allow himself to trust me and find rest. I finally stood with my back to him, staring at my feet, unsure of what Outlaw would do next and leaving the choice up to him. Eventually I heard the soft putter of hooves on the dirt and soon felt the warmth of his breath on my arm. A smile crept onto my face and a happiness into my heart as I realized the progress we had made in that moment. I slowly began to make my way around the round pen, feeling Outlaw moving in sync with me and staying right by my side. He had accepted me as his leader and was ready to be a follower. This is exactly how our relationships work with God. He continues pulling us into Him, but until we are able to fully surrender our hearts, we are unable to rest or find an intimate relationship with Him. After Outlaw finally joined up, the rest of his training was one of the most amazing experiences I have ever encountered. Each day brought its own challenges as well as victories. Even though I had gained his trust and we had begun to build a solid relationship the work was far from over. Throughout all of Outlaw’s training, two things never changed: I always gave him a choice between right and wrong, and I was always willing to forgive and love him no matter how much he disobeyed. Throughout all of my disobedience and running, God stands offering me a choice to accept Him and the grace He has to offer without condemnation. Outlaw quickly learned that when he felt frightened or threatened, he could find safety in me rather than fighting and running away from me. When his surroundings seemed to be closing in on him and the world around him turned to chaos, all he had to do was stop and look to me to know I would be his shelter. When the weight of life feels like more than our human shoulders can bear, all we have to do is look to Christ to know that He will forever and always take care of us. Once Outlaw allowed me to become his leader, friend and protector, we accomplished amazing things. The road together was not always an easy one, but beautiful things came out of the worst circumstances so long as he was willing to trust me and allow me to work in his life. If we place our trust in God and allow him to take the reins in our life, beautiful things can happen and we can become someone we never thought imaginable. This training technique is just one of so many that demonstrate the correlation between my relationship with Outlaw and my relationship with Christ, and the lessons I continued to learn through Outlaw were immeasurable. In my life, I have been the Outlaw, looking at God with eyes full of my own inhibitions and fears, and faced with a choice. God is patient, willing, strong and he never turns his back on us, but will we turn our backs on Him or turn in to His loving embrace? 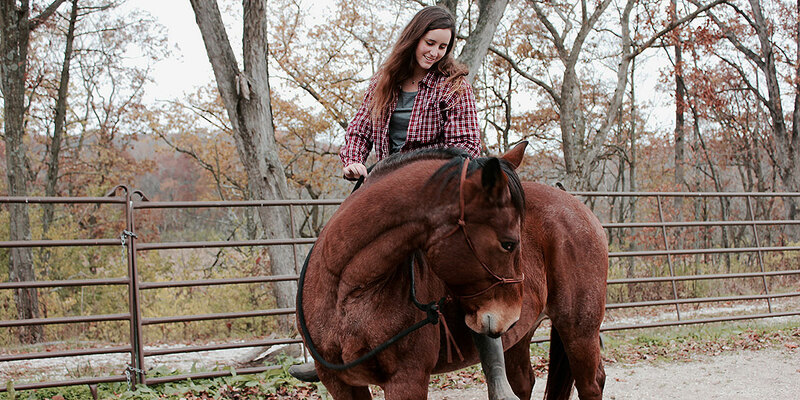 Outlaw, once thought to be untrustworthy and unrideable, is now one of the most popular and reliable horses at a children’s camp, and my relationship with God was strengthened through this wild animal. On an average day, Outlaw can be found with children on his back during a trail ride or in a round pen being used to give a demonstration. As his wildness turned to willingness and his fear to a loving disposition, my little wild mustang continues to change lives like he changed mine. From the first moment we met, staring at each other from opposite sides of the ring, both afraid to blink first, I could not have imagined that my time with one of the most powerful and spirited animals could have ended with such trust, along with a newfound outlook on my relationship with Christ.